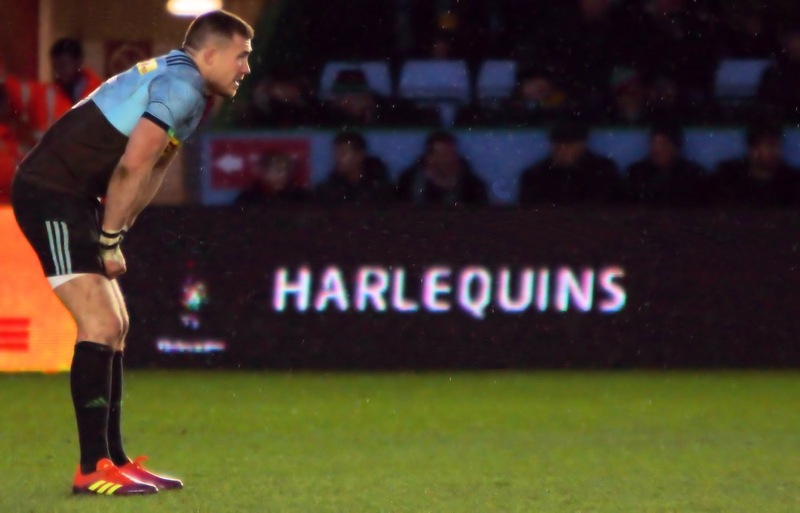 5-tries for Harlequins secured a bonus-point win against French-side Grenoble in the European Rugby Challenge Cup. Other results in Pool 5 today ensured the fight for the quarter-final place continues into next week. Harlequins remain top of their group, just one point ahead of Benetton. Harlequins travel to Agen on Friday. A win for the Twickenham-based club would see them secure a place in the last eight of the competition. 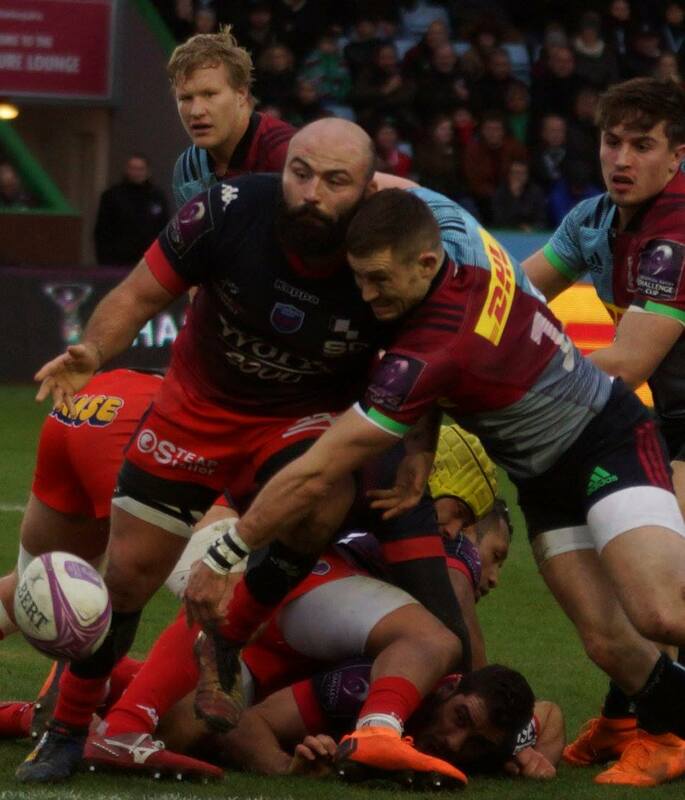 In the first game of 2019 at the Twickenham Stoop, Harlequins welcomed Grenoble in round 5 of the European Rugby Challenge Cup. The two teams last met in France in October where Harlequins came out second best against a team with home advantage. Quins had the home advantage today, and entered the weekend top of the table in Pool 5. At the start of the day, the group was a close contest with just two points splitting the four teams. The visitors kicked off proceedings and stunned the Twickenham fans into silence, scoring a try within the opening 2 minutes. They failed to add the conversion (Captain Antonin Berruyer the try-scorer). Marcus Smith kicked the re-start ball long and Grenoble’s clearance kick found touch just inside the half-way line. Quins secured line-out ball but then handed possession over to the French side in the form of a scrum. Good pressure from the hosts and captain Danny Care doing as much as legally possible to disrupt the release, earned Harlequins a scrum of their own following a French knock-on. As the referee Mike Adamson set the scrum, the fans in the stands started to chant and spur on the hosts. Another knock-on, however, once again reduced the voices to grumbles. The French side fed the scrum and retrieved the ball, earning a penalty as Quins failed to roll away after tackling. The visitors found touch on the 22 and once the ball was back in play, Quins started putting in the thumping tackles. When Renaldo Bothma got his man to ground, Quins were able to turn over possession. Captain Danny Care then gained the ball and ran half the pitch to touch down behind the try-line. Marcus Smith added the extra two points: Harlequins 7 – 5 Grenoble (11 minutes). Grenoble were keen to get the game underway again and chased their re-start kick, putting pressure on the hosts. Harlequins secured the high-ball despite the pressure and Cadan Murley received the ball on the wing, planted a beautiful grubber kick which he chased and regained, before being tackled. Such was the support runners for Harlequins, that the hosts secured position following a strong ruck. They were awarded advantage but this was unnecessary as strong teamwork saw record-breaker Mike Brown cross the try-line on his 309th appearance for the club. 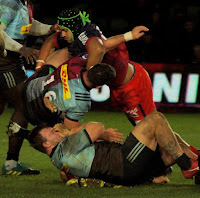 Marcus Smith lined up the posts and added the conversion: Harlequins 14 – 5 Grenoble (15 minutes). Now the fans started to chant with passion. Grenoble again chased the re-start ball but Quins gathered and started to break away on the far wing. Tackles were planted and the ball made it’s way to Smith. The fly-half opted to kick but this was blocked, handing possession back to the French. Another strong tackle and another turnover saw possession returned to the hosts. Offloads to Care saw the scrum-half use his footballing skills to good use – a well-placed grubber kick and Cadan Murley gathered the ball, crossing for a try. Smith added the conversion. 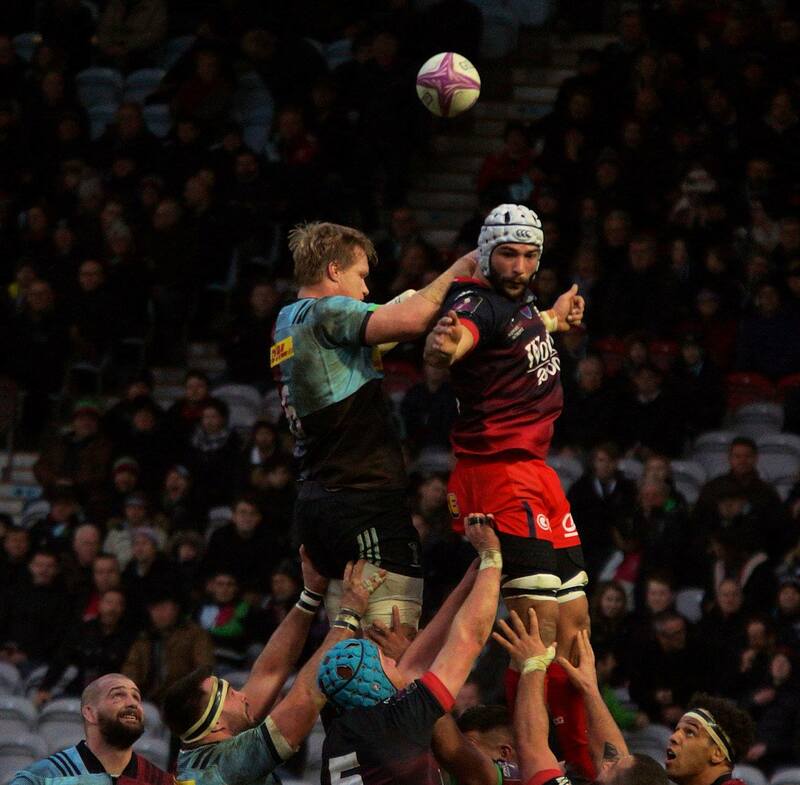 Harlequins 21 – 5 Grenoble (20 minutes). Grenoble sent the re-start ball deep; Harlequins on this occasion choosing to send the ball into touch rather than attempt to run from deep. The hosts were then penalised following the line-out and Grenoble kicked for another set-piece just outside the 22. They gathered the ball and formed a rolling maul. Referee signalled advantage as the maul collapsed. The French sent the ball from one wing to the other but without gaining ground. Back for the advantage and Grenoble again kicked for touch. Cheers erupted as Quins rolled the maul into touch but the French had already secured the ball. They passed it out for their fall-back Gervais Cordin to cross for a try; Conversion added: Harlequins 21 – 12 Grenoble (25 minutes). Harlequins chased their own re-start kick and retained possession after Grenoble knocked-on. Scrum on the 22. After two collapsed scrums, Harlequins were awarded a penalty. The hosts opted to kick for a line-out despite an easy three-point opportunity. They secured the ball and formed a maul. A dive for the line was unsuccessful but the hosts retained possession, earning advantage. They again jumped for the line but no-try was awarded. Play was taken back for the penalty (high tackle) and Quins again opted for the line-out. This time they formed a stronger maul that was too good for the French to defeat. Max Crumpton was the try-scorer. Smith once again adding the conversion: Harlequins 28 – 12 Grenoble (31 minutes). Bonus point secured for the hosts. Quins gathered the re-start ball well; Care box-kicked out and Crumpton chased the ball to plant a strong tackle on the French fall-back. This slowed down the French attack and enabled Harlequins to set a defensive line near the half-way line. Grenoble then changed tactics and kicked through, finding touch on the 22. The visitors maintained possession despite a strong challenge in the line-out from the hosts, and secured their third try (Gervais Cordin). Unconverted. Harlequins 28 – 17 Grenoble (36 minutes). 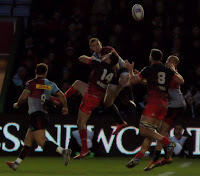 Harlequins chased their re-start kick and a knock-on from the visitors ensured Quins maintained possession until they made a forward pass on the half-way line. The hosts were then penalised for collapsing the scrum allowing Grenoble to kick for touch inside the 22. The visitors retained possession and formed a maul. It was a slow start but the maul gained momentum. Just shy of the line and the Harlequins defence proved too strong. Penalty awarded to the hosts who kicked into touch at the stroke of 40-minutes. The start of the second half saw a scrum just metres from the Grenoble try-line. The French had the put-in and secured possession before finding touch. 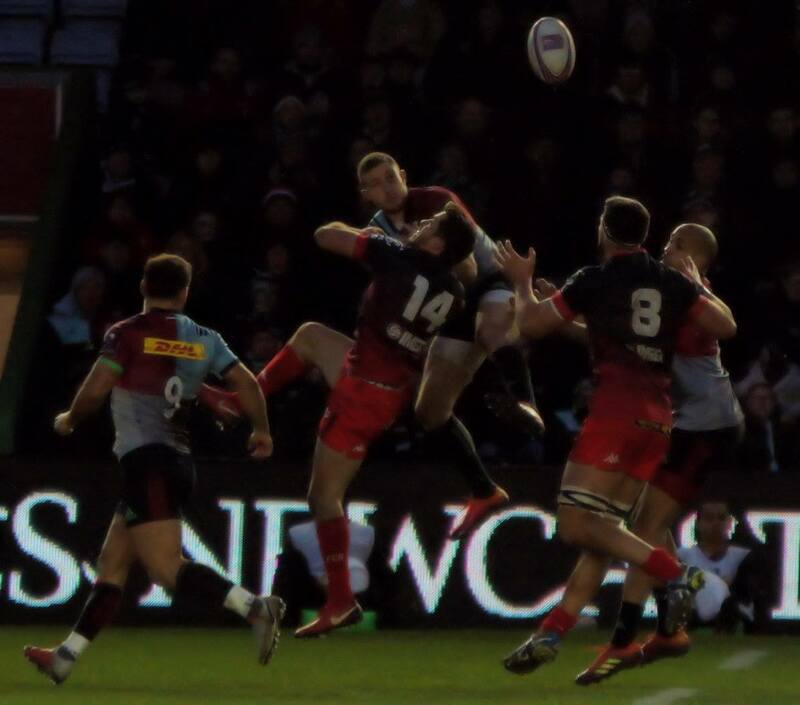 Harlequins threw long in the line-out handing possession back to the visitors. Quins then stole back. The first of the Game Changers then entered the battle as Luke Wallace replaced Renaldo Bothma for Harlequins (43 minutes). Whilst making strides forward, the hosts made a sloppy pass. Grenoble were able to kick the ball on for a chase which Quins won but strong support from the French saw the hosts pushed back into their own 22. A penalty was then awarded to the visitors and they opened the scoring of the second half: Harlequins 28 – 20 Grenoble (46 minutes). It was then the turn of the French to make changes, their first being the tight-head prop as Ali Oz replaced Beka Gigashvili. Quins restarted with a kick they could chase but failed to win back, instead handing a penalty to the visitors. 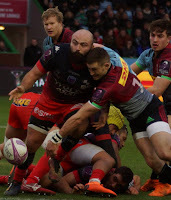 Grenoble’s kick for touch did not gain much ground as the ‘Harlequins’ chants sprung up around The Stoop – the fans realising they needed to be the 16th man in this hard-fought contest. An aerial battle then ensued to settle play and the ball eventually found touch on the half-way line with a Harlequins line-out. Grenoble stole possession but Quins turned them over. The hosts sent a grubber kick long but the ball went dead allowing the visitors to clear their lines. Harlequins ran the ball back into the visiting 22 but a knock-on handed a scrum to the visitors. Gabriel Ibitoye and Marcus Switch left the field, making way for Aaron Morris and James Lang. The scrum was upgraded to a penalty and Grenoble found touch, albeit still within their own half. A huge applause greeted Joe Marler as he joined the field of play, replacing Lewis Boyce for the hosts. The line-out was gathered, maul formed and when the French attempted to pass, Quins intercepted. A knock-on then halted their progress. Further changes for the hosts as Ben Glynn made way for Mat Luamanu (54 minutes). The scrum was solid and Grenoble gathered the ball, kicking for touch. The visitors secured line-out ball but Quins turned over possession at the breakdown. Care then box-kicked from the ruck, sending play into opposition territory. The visitors gathered well and sent the ball high, back into the host territory. Grenoble then raced into the 22, earning advantage; Quins penalised for not releasing a tackled player. Corentin Glenat lined up the posts but pulled his kick wide. Harlequins kicked from their 22 and Grenoble gathered quickly, making it back into the hosts’ territory. Quins stole possession at a time the French were gaining momentum, and themselves made it over the half-way line before Semi Kunatani spilled under tackle (although the touch judge signalled the player strayed into touch before the knock-on occurred). This was Kunatani’s last action of the game, replaced by Dave Ward. Grenoble secured line-out ball but Quins stole possession. Care then placed a long kick from the ruck. Grenoble, on gathering the ball, sliced this into touch. The line-out ball was thrown long but the hosts retained possession. The referee awarded Quins a penalty following a high tackle and on this occasion Lang went for the 3 points. 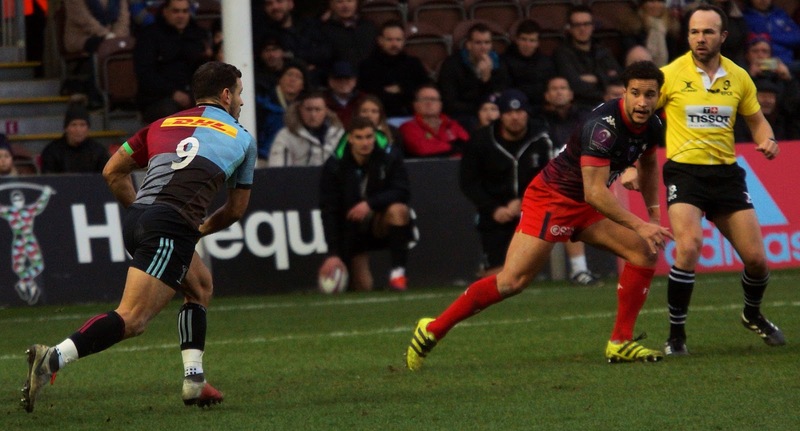 Harlequins 31 – 20 Grenoble (65 minutes). Will Collier was replaced by Josh Ibuanokpe in the front row for the hosts. The re-start ball was kicked long. Quins gathered but their clearance kick hung in the air for Grenoble to gather. The hosts were then penalised and so the visitors placed the ball in touch and secured the line-out. Harlequins turned over possession and Captain Danny Care found length on his box-kick. A good follow-up chase from the Quartered Men kept Grenoble pinned in their own half. 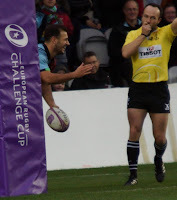 The ‘Harlequins’ chants again resonated around The Stoop, followed by ‘boos’ as the ball found touch with the line-out being awarded to Grenoble. The set-piece on half-way was secured by Grenoble. They passed the ball to the far wing and raced up to the Quins’ 22. The hosts were then penalised for not releasing a tackled player but the damage was limited as another sliced kick from Grenoble failed to gain them any ground. Grenoble formed a rolling mall from the line-out and play raced up to the 5-metre line before they spilled the ball. Quins took their time placing their clearance kick from behind their posts. Grenoble’s Bastien Guillemin gathered the high-ball well and passed to the centre. A superb tackle from Marler slowed their forward movement but Grenoble recycled the ball well. Another spit ball and Lang wasted no time in sending a grubber kick into Grenoble’s territory for a well-placed line-out. The visiting Alexandre Savonnet found his mark in the set-piece and Dave Ward was shown yellow for a high tackle. Quins would finish the game with 14 men. Grenoble placed their penalty kick just shy of the 22 line. They gathered the ball and formed a maul but were penalised for obstruction. Lang cleared his line for the hosts but failed to place the ball outside his own half. A penalty was then awarded to Harlequins after Grenoble illegally entered the maul. Lang found greater distance on this kick. At this point, Harlequins Captain Danny Care was ‘Game Changed’ by Charlie Mulchrone with just 4 minutes of the game remaining. Harlequins attempted a long throw at the line-out but this was not gathered and instead trickled into the hands of the French. Another spill under tackle, however, handed a scrum back to the hosts. Replacement scrum-half Charlie Mulchone fed the ball, gathered quickly and passed it out wide. The attack gathered speed and they made it up to the try-line. After resetting themselves, Alex Dombrandt powered over the try-line; the score converted by Lang.